Potatoes are produced in greater quantities worldwide than any other vegetable. Members of the nightshade, potatoes are related to tomatoes, peppers and eggplants. The potato fruit looks like a small tomato. The fruit is a seed ball that is borne at the top of the plant. The edible portion of the potato plant is the underground tuber that serves as food storage. Potato setting, or tuberization, occurs six to eight weeks after planting, or when the plant is in the early bud stage. 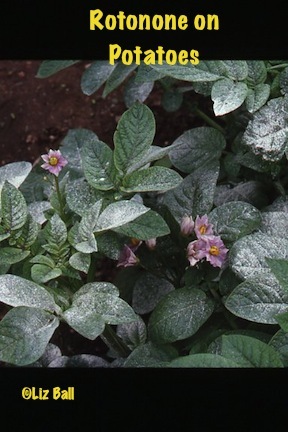 Plant potatoes any time the weather permits after March 15 until April 15 in most northern states. Seed potatoes are available from many farm and garden stores in the state. If potato tubers (which are used as seed) are cut, seed pieces should be blocky and average about 2 ounces. Seed pieces should be cut the day before planting to allow healing. Plant them in 36-inch rows with the seed pieces dropped every 9 to 12 inches. Maintain soil pH at 5.5 to 6 to control scab, although many varieties are now scab resistant. Adults are light brown with black stripes running down the back. Larvae are reddish or brown, soft-bodied, with two rows of black spots on each side of the body. Both adults and larvae can cause severe feeding damage on leaves and stems. This insect pest frustrates home gardeners because many standard insecticides are no longer effective. Hand-pick adults and larvae, and crush egg masses whenever practical. These caterpillars are up to «-inch long, white with a pinkish or greenish tinge, and brown at both ends. They form blotch mines in leaves, bore through petioles and stems causing shoots to wilt and die, and tunnel into tubers in the field or in storage. Do not leave dug potatoes in the garden overnight as moths lay eggs at night, and do not cover dug potatoes with potato tops. Scab appears as shallow or deep corky blemishes that disfigure the potato skin and necessitate excessive peeling. Scab is a soil-borne disease found throughout the world but favored in soils with a pH of 6.0 to 7.5. Where practical, follow a three- or four-year rotation, avoiding susceptible crops such as radishes, beets, turnips, parsnips, carrots, and rutabagas. During the critical period of tuber development, keep the crop is well watered. Currently, no chemical control is available to home gardeners to prevent scab, so use resistant varieties. These diseases are caused by soil-borne fungi and can remain in the soil for several years. General symptoms are yellowing of lower leaves that progresses up the plant, rapid wilting, and premature death. Tuber rot (usually a wrinkled dry rot) is also associated with wilt infections. The fungi invade the vascular system of the plant and clog the conductive tissue, thereby interfering with the transport of water. Because wilts are hard to control, plant only disease-free certified seed; rotate to an area that has not recently contained susceptible crops (tomatoes, eggplant, peppers, potatoes); treat seed with proper fungicide; plant resistant varieties; maintain adequate soil moisture during the growing season. These fungal diseases affect stems and leaves; however, late blight can also cause tuber rot. Early blight appears as circular spots with concentric, bull's-eye rings, usually on the lower leaves. Late blight occurs mainly during cool, wet weather. Infection appears as large irregular spots, eventually turning brown or black. The under surface of infected leaves often has a white fungal mass. Control of blight involves spraying with an effective fungicide.